Over half of the world’s poor will be living in fragile and conflict-affected situations by 2030. Addressing the challenges of poverty and human development is impossible without taking into account the urgent needs of these regions. In its decades of field experience, IFC has found that the private sector can drive growth and create markets in fragile and conflict situations. Fragile and conflict-affected places need investment to create jobs, spur economic growth, rebuild infrastructure and create a sense of hope for their people. Simply put, a society with an economic stake in peace may be less likely to return to conflict. Still, investors, particularly foreign ones, including development finance institutions, approach fragile environments with caution. Not only must they contend with instability and weak institutions, more prosaic problems, like lack of market information also deter deal-making. This article will share some of the lessons we have learned, in the hope that they can be of value to other development institutions and private investors embarking into fragile markets. Why focus on fragile and conflict situations? Over half of the world’s poor will be living in fragile and conflict situations by 2030. Conflict is increasingly expanding beyond national boundaries to have regional footprint. In Africa, over the last decade, several conflicts have taken on a sub-national dimension (take north-eastern Nigeria as an example, where crisis unfolds in the midst of a middle-income country). Then, there are regional conflicts that impact not one but several nations – in the Sahel, for instance, the impact of strife can be felt across borders from Mali to Central African Republic – both amongst the lowest ranked countries in the Human Development Index. Ending extreme poverty will not be possible if global development leaders do not address the drivers of conflict and instability. As conflict evolves, so must our approaches, so that we are more flexible and adaptable. The key however, is to tap into the dormant potential of the private sector. Studies have shown that in fragile and conflict-affected states, up to 90% of all jobs are created by the private sector. A dynamic private sector also can help restore key amenities like roads, ports, electricity, transport, and services, while generating tax revenues for the government. Studies have shown that in fragile and conflict-affected states, up to 90% of all jobs are created by the private sector. One cannot develop local market intelligence, liaise with authorities, companies, local business groups, and finance, customs or judiciary bodies without being in field, close to clients, partners and key stakeholders. More than 80% of IFC’s FCS investments are done in countries where we have a presence. This has financial implications, as operational costs are more expensive in fragile countries, and institutions need to identify, attract and incentivize staff to relocate there. The profile of staff also matters – waiting for projects to be submitted to one’s attention may not be the most effective way of building the portfolio. People stationed in fragile countries need to be entrepreneurial, passionate, and be able to weather the ups and downs of such markets. Fragile and conflict situations require long term investors who can adjust instruments, innovate and pilot, understand contexts, build relationships, and to overcome challenges. Opportunities in fragile markets take time to cultivate, and are linked to political stability. In IFC’s case, four years ago our portfolio for investment in fragile countries in Africa was driven by Cote d’Ivoire and large infrastructure projects; while in recent years, we have increasingly been focusing on Democratic Republic of Congo and (more recently) Madagascar and have diversified the industry focus, with a fast growing Manufacturing, Agricultural and Services portfolio, including with smaller local sponsors. Adjusting to changing markets and redeploying resources calls for long term institutional commitment. Doing business in fragile and conflict situations is not business as usual. Conducting due diligence is tough when young businesses lack track records, when family holdings rely on opaque governance, and there is limited market intelligence. High levels of risk are both endemic to fragile countries and poisonous to investment. Development finance institutions should seek to leverage private capital and avoid depending on the government’s sovereign guarantees. Local currency financing also goes a long way in reducing risk of foreign exchange for sponsors in fragile countries. IFC’s IDA 18 Private Sector Window (PSW), for example, sets aside 2 billion dollars through innovative financial tools to mobilize private capital and de-risk private investments in fragile countries. The IDA 18 window offers a blended finance facility that will spur investment across sectors, an infrastructure window and a local currency facility [Figure 1]. Providing hands-on advice to clients in fragile markets can help them become investment ready by improving their governance, increasing operational efficiency, and becoming compliant with international environmental and social standards. Development institutions can also use their advisory services to encourage responsible investment. Environmental and social sustainability have become increasingly important for the private sector, especially in fragile countries. An investor who respects the society, culture and environment of a fragile country earns its license to operate in this complex environment. As of April 2017, IFC has an active portfolio of 56 advisory projects (for a total value of USD 72 Millions) in African FCS with on average 12 new projects approved every FY. IFC, a member of the World Bank Group, has long been promoting private sector development in conflict-affected countries that show an appetite for reform and growth. During the past fiscal year (2016), IFC invested over one billion dollars in fragile countries, in projects that are generating power, reviving telecommunications, increasing food security, helping entrepreneurs access finance, and creating jobs for women and youth. We have also mobilized another 375 million dollars from other investors. Every fragile situation has a complex set of trials, but IFC’s experience in the field has found that businesses can thrive, and partnerships can be built, even in the most challenging environments. The political economy of fragile and conflict situations involves complex connections between business and politics. Investors should be mindful that their investments do not reinforce – or ignore – old antagonisms and trigger new ones. Investors must rigorously assess the impact their operations may have so that they do not cause further harm to the delicate social fabric – although this political economy assessment may be costly, it is best done before investing, as opposed to after investments, when the damage control is far more difficult, and the impact on the investor’s reputation and market value may be very high. This means considering competition over resources, value chain structures, the roles of ethnic or rebel groups, and women. Amongst development finance institutions, IFC is today the largest investor in fragile and conflict situations, accounting for 42% of the cumulative DFI investments. Getting here has required dedication, as well as innovative approaches. 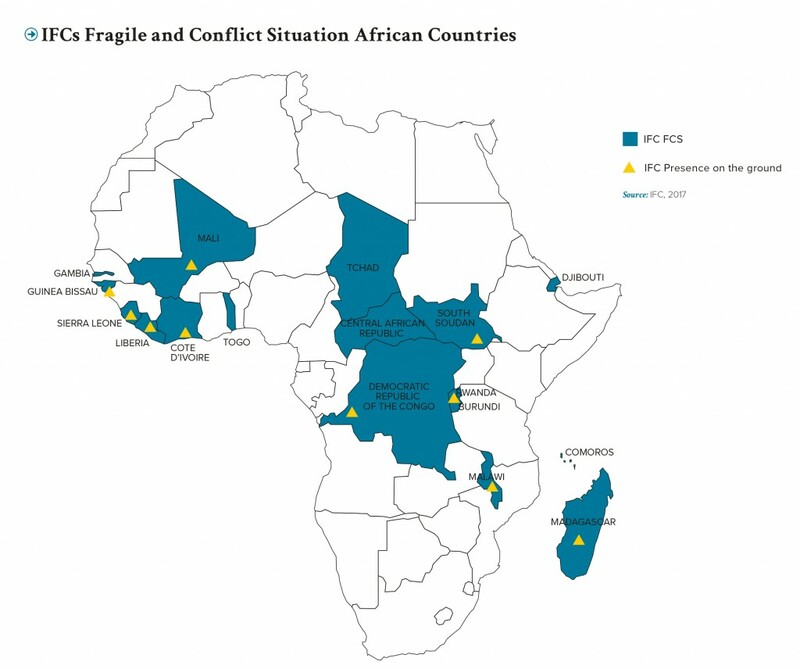 IFC’s “Fragile and Conflict Situations in Africa” program, for example, puts people on the ground in FCS Markets to provide market intelligence, facilitate engagement with sponsors and key stakeholders and support business development [map]. Partly donor-funded, the program allocates between 5 to 7 million dollars on a yearly basis to finance advisory services that support existing and potential clients in fragile countries, and helps improving the business environment. The program also has an increasingly keen focus on cultivating and disseminating knowledge on how to do business in these environments. While IFC has made strides in fragile and conflict situations, we understand that the heavy lifting requires the hands of many investors and institutions. This spreads the risk, but also brings a greater depth of experience and funding to projects. Investors who are eyeing fragile markets, but not sure that they want to take the risk should remember that despite the challenges, fragile states are not prisoners of their history. With the right reforms and investment, they can lay the foundations for growth, and maybe even become tomorrow’s leaders.